Courtesy Third-grader Devon Wright, who as a kindergartner was photographed helping another student on his first day of school. A framed photo of Devon’s kindness was recently presented to former state Sen. David Long. “I will never forget the other young man (in the photograph) didn’t have a clue where he was going, and neither did I,” Robinson said during a January school board meeting, Devon standing near her. 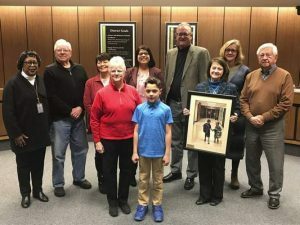 Robinson and Kathy Friend, the district’s chief financial officer, presented a framed print to former state Sen. David Long in appreciation of his relationship with the school district. • Students in fourth through sixth grades have until Feb. 28 to enter an essay contest sponsored by Indiana’s Family of Farmers in celebration of National Ag Day. Winners will receive $200 for first place and $100 for second place and may attend a recognition ceremony at the Indiana Statehouse on March 18. Go to the Indiana’s Family of Farmers Facebook page for details. • Indiana Tech’s College of Professional Studies will host an open house from 5:30 to 7:30 p.m. Feb. 21 in the Seitz Conference Center in Andorfer Commons, 1600 E. Washington Blvd. Go to ind.tc/openhouse for more information or to RSVP. Working adults seeking a manageable way to fit education into their lives are encouraged to attend. • Meijer donated $1,006.50 in gift cards for Ivy Tech Community College Warsaw’s newly formed emergency food and supply pantry. Circle of Ivy, the women’s philanthropy group at the school, also raised more than $2,600 for the project. The combined funds are expected to keep the emergency pantry stocked for about a year. • Lara and Tony Gaerte of Century Aviation in Auburn donated avionics equipment and manuals to the Ivy Tech Foundation for Fort Wayne’s aviation maintenance technology program. The donation was appraised at $55,000. The aviation program prepares students for taking the Federal Aviation Administration licensing exam. • The University of Saint Francis has reduced per-credit tuition by up to 40 percent for multiple master’s degree programs. It now offers differentiated pricing for its graduate programs to ensure each program’s tuition is aligned to the market. As part of the cost adjustment, the university is phasing out its Alumni Tuition Rate. For more information on the new rates, contact Graduate Enrollment Services at 260-399-8000. • The Boys & Girls Club of Huntington County was recently awarded an $80,000 grant from Indiana’s Office of Early Childhood and Out-of-School Learning. • The Accreditation Council for Business Schools and Programs has reaffirmed accreditation of Trine University’s business programs. The organization accredits the bachelor’s of science in business administration; associate in accounting; and associate in business administration programs. The business programs were first accredited in 2008. The university must go through the reaffirmation process every 10 years.